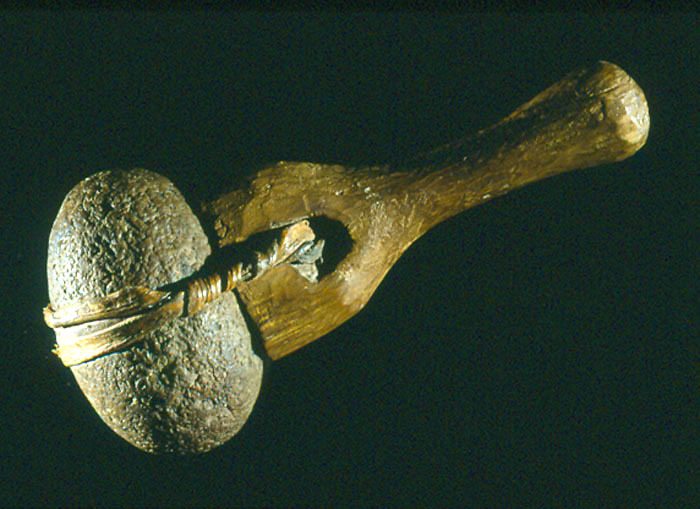 Hammer consisting of a stone head that has a groove carved around its circumference. The head is attached to a wooden handle with a thick sealskin thong that has been wound around the groove and tied to the handle. Learn more about the interaction between Aboriginal groups and Europeans - enter 'trade' or 'customs' in the search box to your left. This hammer was used for splitting open the long bones of animals such as caribou, for the marrow. Marrow was generally eaten raw and was extremely nutritious. It is a rich source of vitamin A, phosphorous, iron, thiamin, protein and polyunstaturated fatty acids. The hammer was collected from the Chukchi who are Indigenous peoples of Chukotka in the far northeast corner of Siberia. They are both coastal hunters who primarily depended upon whales, seals, and walruses, and interior reindeer breeders and herders.